A card game with 2 distinct roles — a Guardian who builds and protects a dungeon and a Hero who explores the dungeon in search of loot! Final Box Art: One side for the Hero, the other for the Guardian.Final Box Art: One side for the Hero, the other for the Guardian. 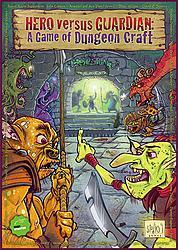 DungeonCraft takes 45-90 minutes to play. Within a round players spend tokens to take actions in an alternating sequence. Basic in its concept yet elevated in strategic options, the game combines some elements of chance with your ability to read your opponent's strategy.